I used to hate the fool in me, but only in the morning. Now I tolerate him all day long. I’m off to see my favorite girls in the whole wide world and get into heaps of trouble! I hope you all have a nice weekend! Have fun. I love the leopard! Have a blast!! You look gorgeous, as you always do! I seriously love that last pic… you look fierce, like you are going to get into trouble but not get caught… LUV it!!! You always find the most unique and interesting prints! Are those the new Givenchy open-toed boots? If so I may have to murder you for them. Jk. kinda 🙂 Love this outfit! oooo! have a BLAST! you know i love that swanky cardi…. I love that robe – its so cool! ah i remember this top! i've always wanted an item of clothing i could both wake up in and wear out on the same day! love so much your vintage leopard print robe thing! Is super amazing! Leopard & floral… gorgeous combo. And Givenchy… always perfection! I love the leopard robe. I want that vintage robe, E! You always have a good outfit collection. I die for that jacket thing. This is a look I'd wear in a second. Have fun. Sounds exciting. Ooo pretty outfit. Nice colours. I like your green sweater in the outfit before also. I love the leopard robe thing! its stunning! and it sounds like ur going to be having fun! Heaps of trouble? Sounds awesome! Have a stylish and fun weekend! Awesome outfit. That top is so pop-y! That vintage robe thing is amazing! What a fantastic and unique piece! I hope you have a blast out with your girlfriends! What a great idea to wear that robe over the all black outfit. I wish you had taken a close up of the boots, they look very cool. Hope you have a blast with the girls. loving loving loving your "vintage robe thing". Have fun!! gorgeous jacket, you look amazing! I love how you used a robe as a cardigan, it looks amazing! Love how you are incorporating vintage with modern! Also all your swap goods will be sent out in the next couple days! Yahoo! The return of the vintage leopard robe thing! You wear it so well. Great overthing, I love the colours in it. 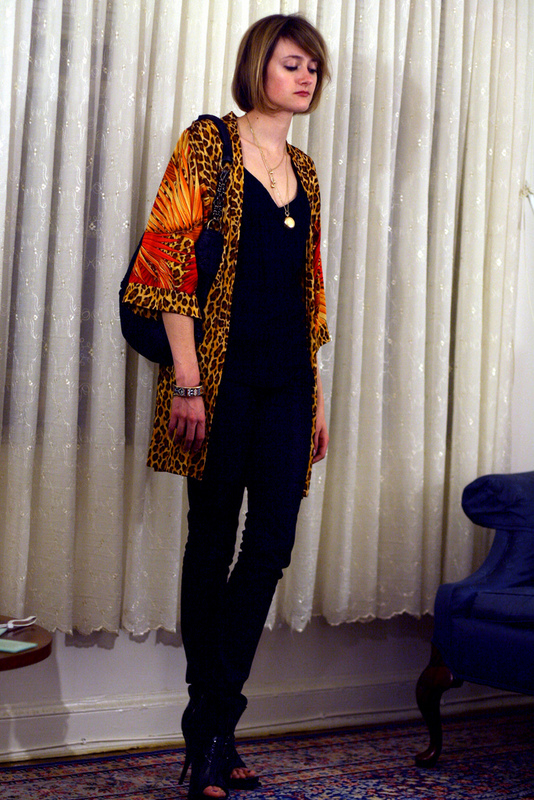 I *love* that leopard robe, it is awesome!! Hope you're having a great weekend!! Oh, I love this robe. It's perfect for doing crazy things with friends. I just love your outfits. Love the "robe thing" it makes you look so glamourous! First step to wisdom… Perfect outfit for fun and trouble. Hope you've enjoyed yourself! Love the kimono/robe thingy, it's gorgeous! girl! You have the most beautiful jawline and face! Ever considered cutting your hair short? thanx for your comment!! !i love your outfit!!impressive!!! Love that cheetah robe! Love it. I love the "robe thing". It's so vibrant! Great "robe think". Like the colours, and it creates a contrast to the rest of the outfit. You use it great. Love the color over black. Did I tell you I finally got a Km Rii bag – love it! Ahhhh I'm your favorite stalker! One day can we get in trouble together?! Seriously. Hope you had a rockin weekend, darling E! oh you look so sassy in that last picture! hope you had a wonderful time! !